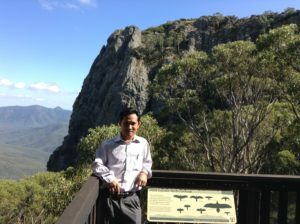 Dr Yorn Try, Vice Rector of Meanchey University in North West Cambodia, was offered a four-week training visit to Australia as part of the 2016 Crawford Fund Training Award Program. The overall aim of the program was to expose Dr Try to leading field research of direct importance to producers in Cambodia. Dr Try’s visit recently took place and he was hosted at the University of Sydney’s Plant Breeding Institute in Cobbitty. He had extensive travel throughout New South Wales, especially to NSW Department of Primary Industries sites of relevance to Cambodian agriculture. With a PhD in Entomology from Hanoi Agricultural University, Dr Try has been successful in establishing training in agronomy (rice and upland crops), ancillary production (mushrooms from rice straw and honey production), and small-scale animal production; all the while encouraging and researching the practical adaptation of technology to local conditions. He has also established small-scale food-processing and laboratory operations in his university, to provide further practical training for students. More recently Dr Try (pictured) has made links with donor agencies and NGOs, as well as government ministries, to capture more resources to continue and expand this work in agricultural education. He has come to be at the centre of a network of poor South East Asian universities all engaged in ‘self-help’ and ‘train-the-trainer’ programs. It is expected that this training visit will have assisted Dr Try to gain experience in linkages between producers and input suppliers, providing agronomic advice (both public and private), and how off-farm value chains are organized and operate. This training experience will help Dr Try to enhance the practical knowledge of agriculture skills in the region of SE Asia.